The latest stop on the David Ortiz retirement tour is in Minnesota, where the slugger started his career. Now you’d have to imagine it’s somewhat tough for the Twins and their fans to honor the star, considering Ortiz had his best years in Boston, and beat up on the Twins and the rest of the American League for years. But, the Twins really treated Ortiz well on Friday night at Target Field. 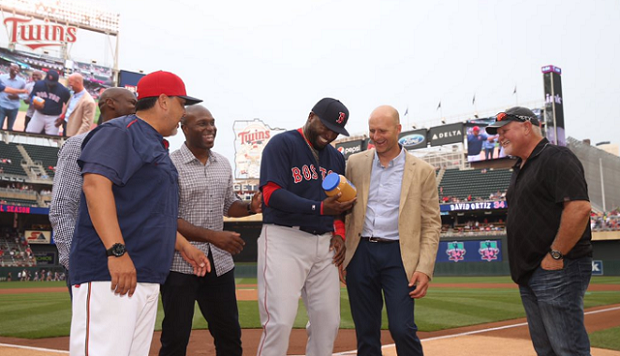 Torii Hunter, LaTroy Hawkins, Eddie Guardado, Corey Koskie, and former manager Ron Gardenhire were on the field with Ortiz during the pregame ceremony. Ortiz got a jar of peanut butter to commemorate Koskie once filling his underwear with some Skippy. Old prank from back the day. The team also made a donation to the Puckett Scholars in honor of his career. The foundation is named for legendary Twins outfielder Kirby Puckett, one of Ortiz’s favorite players coming up in the league. Ortiz’s retirement tour has been great to watch all season, but it was great to see him return to the city where it all started for him. To see them make good on their tribute to him was also great, as we know some franchises are better at these things than others. Hopefully Ortiz can make the most of the series in his final ride.